Before I met Jon, I was a sheltered eater. I grew up in a small town in Northern Illinois. Family meals consisted of Crockpot stew, roast beef, pork chops, and mashed potatoes. Occasionally we ventured out to Polish sausage or lasagna. The only restaurant in our little town was an Italian Dari-ette that also served Pizza. Jon, on the other hand, grew up in the Chicago suburbs, surrounded by a wide variety of ethnic restaurants. I will never forget the first time he introduced me to Indian food. He had come to visit me at college in Illinois for the weekend and we were on our way back to the train so he could make the trek back to Indiana. Usually, I dropped him in Naperville, so he could catch the Metra heading downtown to Union Station. But on those Sunday afternoons, facing a long week without him, I drug my feet and stalled as much as I could, drinking up the last few moments I had with him. This particular weekend was no exception. I didn’t want him to go. I deliberately missed the train in Naperville, so the only choice I had was to drive the extra hour downtown so he could catch the train to Indiana directly. It gave me a few more hours with him. This was the afternoon he introduced me to his favorite cuisine. To pass the time, we stopped at his favorite Indian restaurant in Oak Park. My love affair with Indian food began that evening. The rich smells, vibrant colors, and the intense flavors… the entire experience filled me up. I had never had anything like it and I couldn’t wait to have more; to try everything on the menu. 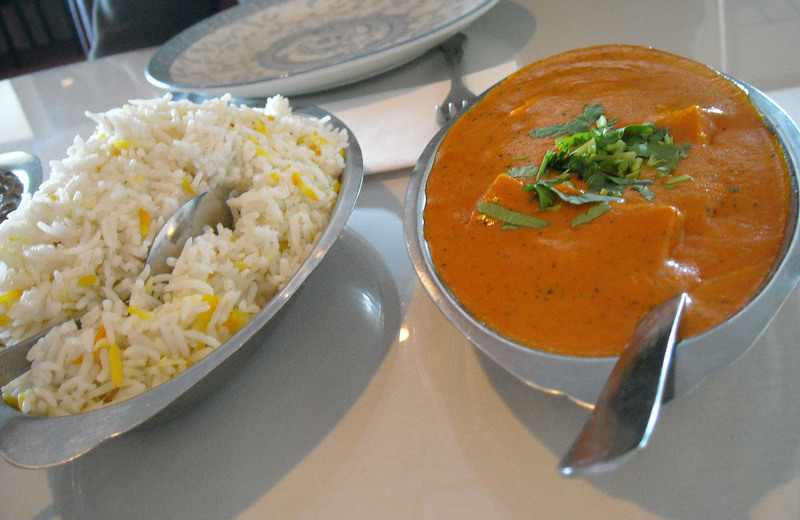 Two years later, when I finally joined Jon as an Indiana resident, we were pleasantly surprised to discover amazing Indian cuisine at Taj Mahal, then located on Coldwater Road, now on West Jefferson. Perhaps our favorite thing about Taj is the buffet, which is offered every day at lunchtime and on the weekends, because we can never choose which dish to eat. We want to sample them all, and the buffet offers us that option. It’s also a good option for those who have never had Indian food. You can try a little bit of everything to determine whether or not its for you. After years of sampling, I’ve landed on a favorite dish: Paneer Masala, a rich dish made with Indian cheese and a creamy sauce. Jon is a fan of Saag, a spinach and mustard leaf based curry dish, made with either cheese, lamb, chicken, beef or shrimp. 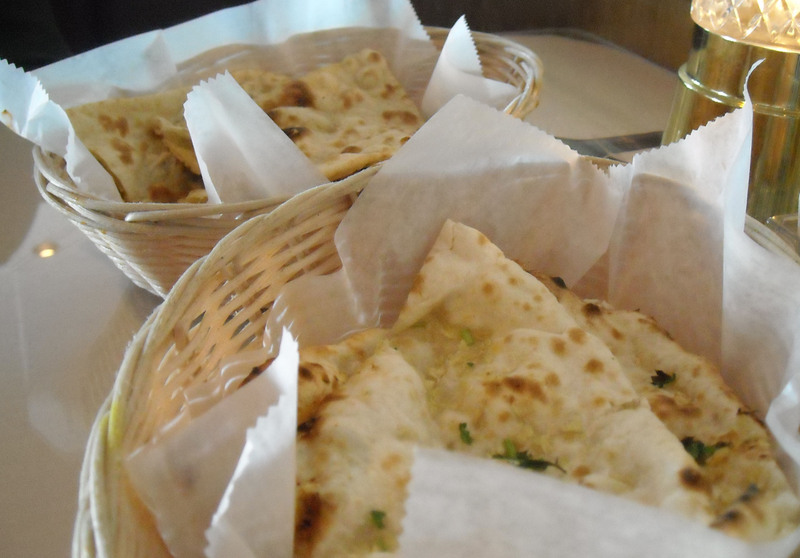 Most dishes are served with basamati rice and naan, a leavened, oven-baked flat bread. You can order your dish mild, medium or spicy. My tastes are more delicate, so I always order mild, which still has a slight kick. Jon usually orders his medium and spices it up with Indian pickles or onion chutney. If you’ve never had Indian food, I’d urge you to try Taj Mahal. Even if you don’t enjoy the food, the experience will be something to remember. I, too, love the Taj. I tend to order the spicy chicken curry, being a minimalist, and partly because I just can’t get into the paneer. I don’t know why. However, when I go there for lunch, I tend to go a little crazy on the buffet. There have been some times when I’ve had the Taj Mahal buffet for lunch and went home to take a three hour nap because of how much I’ve stuffed myself. You’ve tried the paneer and don’t like it? Jon made it once- whoa, what a complicated process. I too go crazy on the buffet. I get to “unbutton the top button” and have to stop myself from eating more. We love Taj Mahal! It’s become a bit of an addiction after yoga on Saturdays. We work off 1000 calories then put back 3000; cheating death-by-starvation for another day. And some day, I will reclaim my mayorship from you, Tuck! THE TAJ MAHAL WILL BE MINE! I was really waiting for this one!!! 🙂 Love your blog… Btw… There are a couple of our favorite restaurants in Indy- named India sizzling and Udupi Palace. Our lunch together is long overdue.. let me know when you are free! Ooooooohh, right there with ya! I have an equally high appreciation for Indian food that borders on obsession. ← So You’ve Got the Grey Sky Blues?